It’s an El Nino year. So that’s supposed to mean a quiet Atlantic Hurricane Season, right? But as the tenth storm of 2015 threatens intensification, very heavy rains, and broadening wind fields as it’s expected to cloak itself in a frontal storm along a track a little south of Sandy — it appears a climate change — riled ocean and atmospheric system have failed to get the message. Anyone looking at today’s ocean-atmospheric conditions and the Global Forecast System model run predictions probably couldn’t shake off the shivers as a number of chilling similarities to Superstorm Sandy began to show up in the five day outlook. The forecast is very, very uncertain. But it appears we might have a developing Superstorm-like Joaquin on our hands. A freakish ‘Storms of My Grandchildren‘ type cool pool dominates the northern Atlantic. The backed-up Gulf Stream off the US East Coast is super hot (1-6 degrees Celsius above average). A massive trough is digging in — telegraphing from Norway through Iceland on to Southern Greenland, extending yet southwest over Newfoundland and the Northeastern and Mid Atlantic US. Further south, a developing Hurricane Joaquin over the Bahamas is about to shake hands with this massive trough. Just south of Newfoundland, a blocking high pressure system appears ready to bar Joaquin’s passage to the north and east. Setting up the potential for Joaquin to embed in the trough, to develop a rapidly expanding wind field even as it strengthens, and to possibly make a sickening left turn into the US East Coast. Sound familiar? If so, it’s because you heard a similar story back during late October of 2012. Currently, Jaoquine is a strengthening category category 2 hurricane packing 105 mile per hour (updated) winds as it drifts toward the southwest near the eastern Bahamas. Over the next two days Jaoquin is expected to strengthen, possibly into a powerful major hurricane, even as it begins to track toward the north and west. This track will result in its interacting with the large trough mentioned above. Even if Jaoquine does not make landfall, its interaction with the trough is expected to dump substantial and torrential amounts of rainfall from North Carolina on through New England even as it drives a broad tropical storm force wind field and related storm surge onto shore. According to NOAA forecasts, 5 day rainfall totals are now expected to exceed 7 inches throughout large sections of North Carolina, Virginia, Delaware, New Jersey and Maryland with measures in excess of 5 inches expected from South Carolina all the way to Nantucket. Joaquin’s wind field is also expected to expand as it interacts with both the trough and large circulation of the blocking high to the north and east. This broad wind field will bring at least strong nor-easter like conditions to the US East Coast. But the broad clockwise circulation off the blocking high also heightens risks that Joaquine will be shoved onshore even as it strengthens. If such a forecast does play out, it’s bad news. Very very bad news. It would represent a potentially very severe category 1-3 storm embedded in a large wind field and an even larger rain shield. A storm bringing heavy rains for days and lashing the coast with gale force winds up to 24 hours in advance of landfall. Features that would greatly enhance storm surge and flooding impacts — which could be very far reaching. It’s a dangerous potential interaction between Joaquine, a persistently extensive trough stretching across the North Atlantic, and one of the new, heavyweight, blocking patterns that have become so prevalent in this age of human-forced warming. One that could again wrap a hurricane in a, this time very wet, nor’easter. Like Sandy, it would also serve as a herald for the oncoming new, more intense climate-change driven storms of our present age. Storms that have greater north-south energy exchanges. Storms that may be more more likely to form embedded or hybridized systems and storms that tap both the higher potential pressure and temperature differentials as well as an atmosphere that is more heavily laden with moisture. Is Joaquin Another Superstorm Sandy? 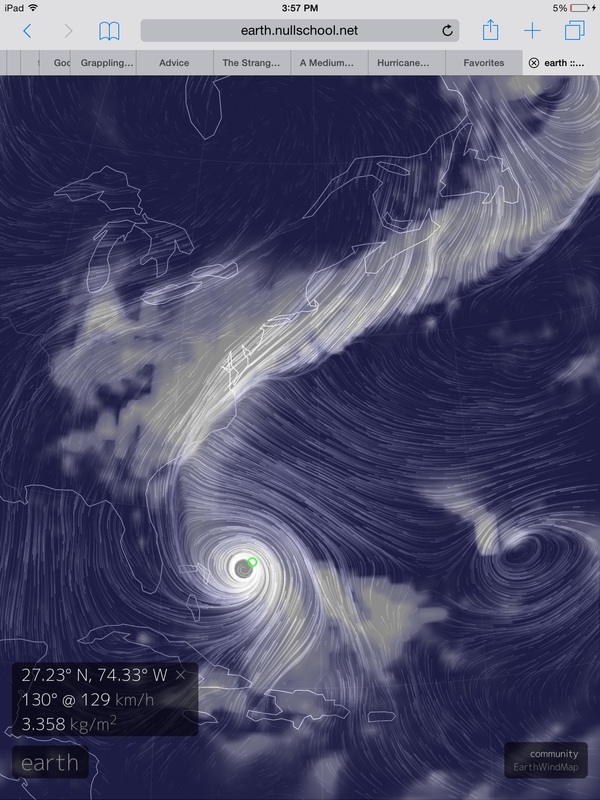 How Will Joaquin Compare to Isabel/Sandy?